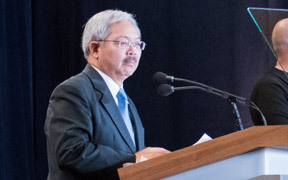 Mayor Edwin M. Lee today presented his two-year balanced budget, proposing a $10 billion outline for Fiscal Year 2017-18 and a $10 billion outline for Fiscal Year 2018-19. The two-year budget focuses new investments on reducing harm on our streets and homelessness, while maintaining historic funding levels for parks, street repaving and other infrastructure projects. The budget preserves ongoing investments in housing, transportation, education, and the arts as well neighborhoods and small businesses while constraining government growth.